[update: the links have been updated] In this post, I list a number of SPARQL queries that show the way external sources can be used to provide enriched access to the Verrijkt Koninkrijk text. The queries go with a two-page abstract entitled “Enriched Access to a Large War Historical Text using the Back of the Book Index” I submitted to the SWAIE 2012 – Semantic Web and Information Extraction workshop I will be attending. These queries use the back-of-the-book index that has been converted to SKOS and was subsequently aligned with a number of datasources. The queries can be entered in the interactive SPARQL interface of the Verrijkt Koninkrijk semantic server, which can be found at http://semanticweb.cs.vu.nl/verrijktkoninkrijk/flint/ . (login: sparqltester, ww: sparqltester). Edit 3 oct: I continued experimenting with some other SPARQL queries and used Willem van Hage and Tomi Kauppinen’s excellent SPARQl package for R to do some quick-and-dirty statistical analysis. I used a variant of the query above, but with the province as a variable. 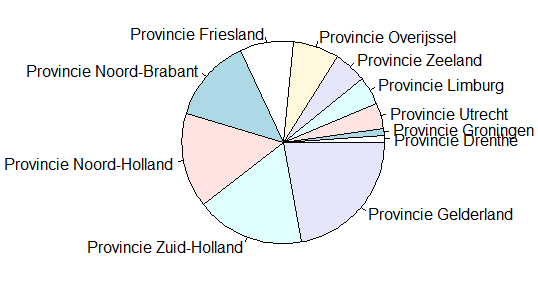 I put the results in a pie chart showing Loe de Jong’s mentions of places found in each of the twelve provinces of the Netherlands. I will leave the historical interpretation of these charts to the reader. Note however that a major disclaimer is needed. There are numerous errors in the data, including OCR errors, and concept mapping errors. 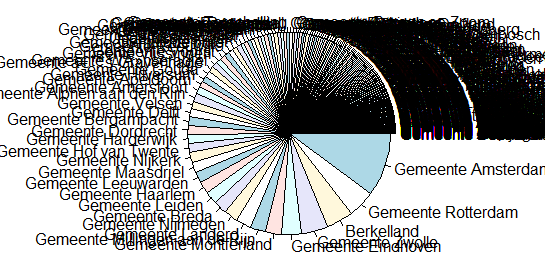 I am sure that the municipality ‘Berkelland’ is not as important as it now seems. Also, the data should be normalized by province size to give a better idea of what is going on. The point is however that -given the linked data- these analyses are ridiculously easy to perform with SPARQL and R.